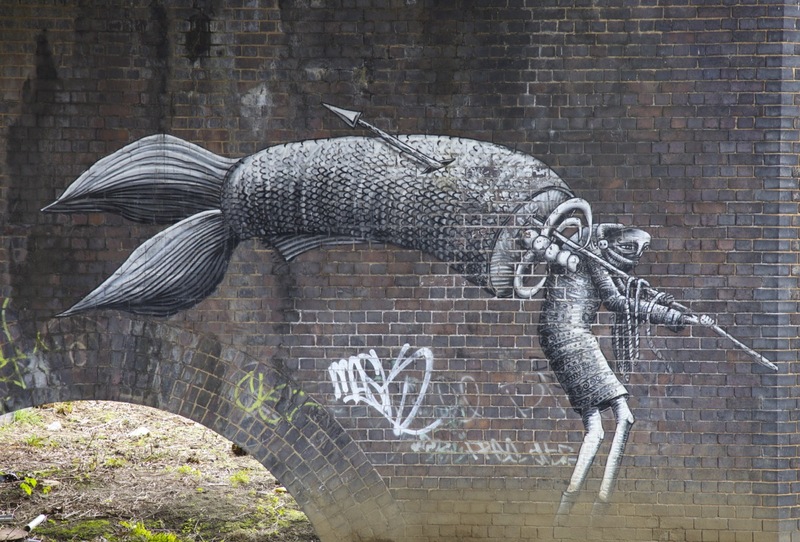 The artist with the nom de plume Phlegm has an international reputation as one of the most inventive street artists working today. Banksy may be the leading figure in the recent commodification of urban graffiti (his new works now regularly protected by hastilly-mounted sheets of perspex), but his prominence often overshadows the extraordinary flowering of urban street art in cities across the world today: from the powerful political murals in Buenos Aires to the omnipresent splashes of spray paint that adorn almost every one of Detroit’s thousands of abandoned buildings. 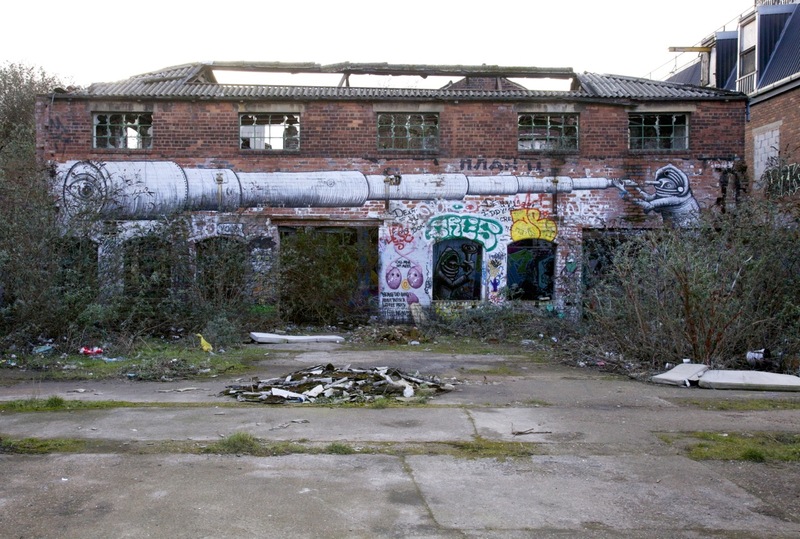 Still occupying an ambivalent zone between the legal and the illegal (with many graffiti artists still prosecuted for their activities), urban street art is also positioned at the juncture between the usually antagonist discourses of blight-busting and creative appropriation of defunct buildings and structures. 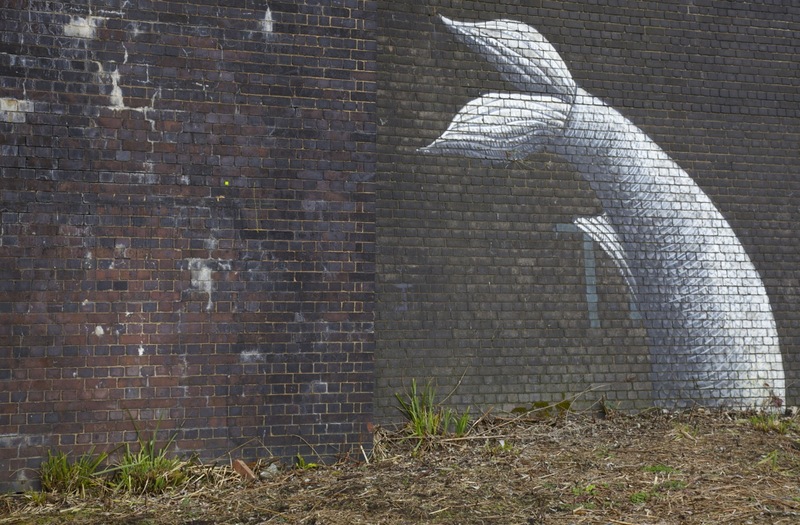 Think what you will of its value, there is no doubt that graffiti changes both the aesthetics and experience of the built (and unbuilt) environment. 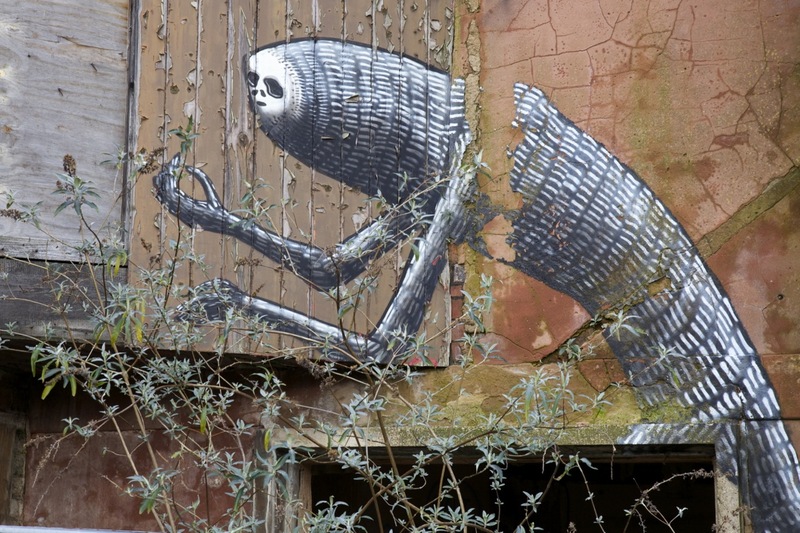 Phlegm’s Sheffield-based work (his most concentrated of a vast series of works that can also be found in cities in Spain, Australia, Norway, Canada, Sri Lanka, USA and Poland) provides a touchstone that links together the city’s numerous abandoned buildings. Cycling along the River Don (Sheffield’s principal river and site of heavy industry since the early nineteenth century), from the railway station to the edge that is now the vast Meadowhall shopping centre, Phlegm’s works are like invitations into a secret world; a group of murals glimpsed from the canal tow path involved a subtle navigation of brownfield sites to get right up close to them. 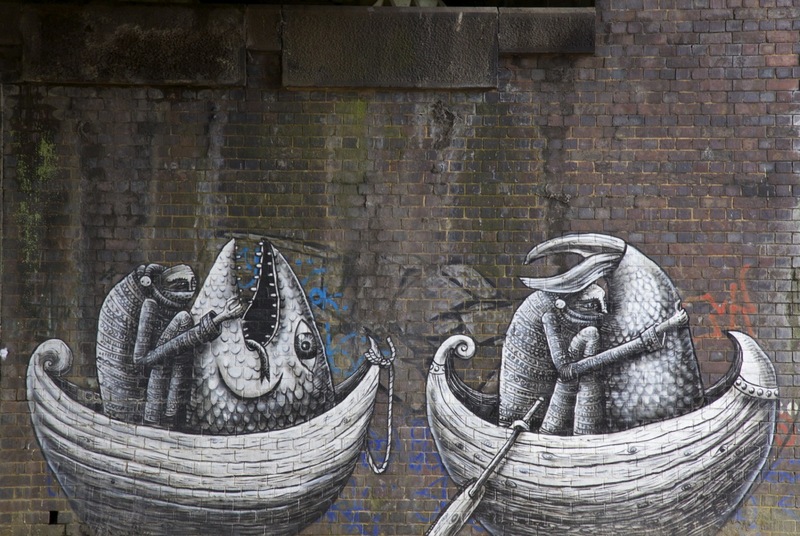 Three fish-based pieces: on one side of a brick viaduct two figures hunched in coracles carry outsized fish (1); directly opposite, another figure hauls an equally outlandish catch skewered on a spear (2); while, on the other side of the wall, the tail end of another huge fish seems to emerge directly out of the ground (3). 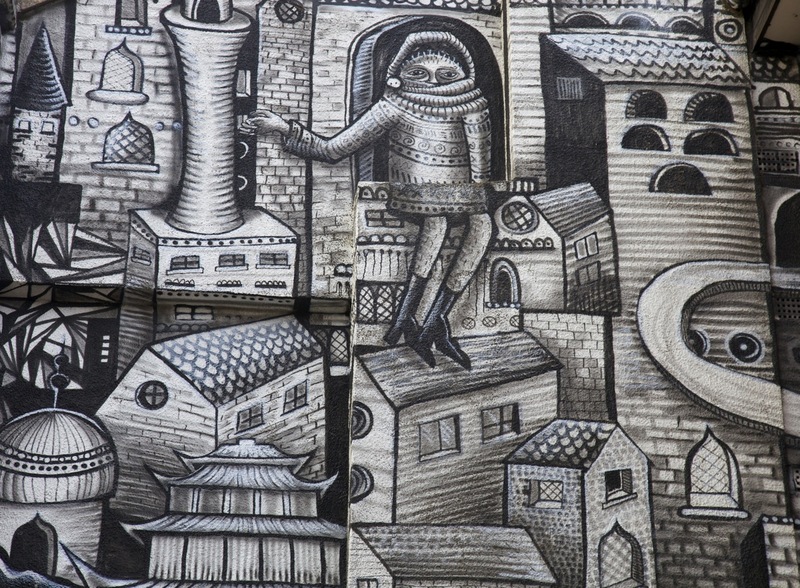 The enigmatic figures in Phlegm’s murals – often shrouded in wraith-like garments – were first developed in his self-published comics. These figures are always ambivalent – half childlike, half menacing – and long-limbed, as if they had emerged secretively into the city from some mythic woodland existence. They are part of a bestiary (the title of his first solo exhibition at the Howard Griffin Gallery in Shoreditch in 2013), an ever-evolving but deeply personal collection of dream-like creatures that present strange narratives that now link cities across the world. Those in Sheffield (and I only found a few of them) invite a more localised reading: one figure holds an outsized telescope that reaches right across the façade of a city-centre ruin (4; a ruin now almost completely covered in graffiti art); near the River Don, a worm-like figure has itself eroded into the ruined wall that it adorns (5); while a relative of that same figure seems to carry a whole fantasy city on his back on the side of a shop in the University district (6). 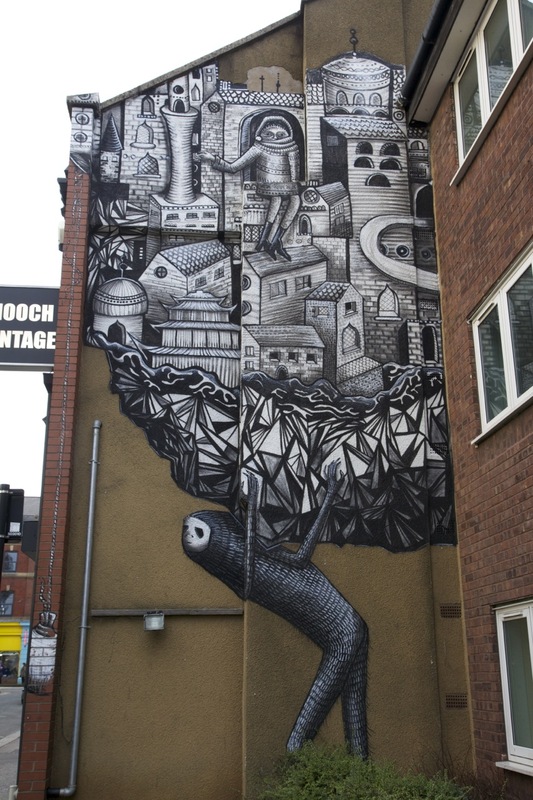 Increasingly straddling the illicit and the legal (the shop mural is one of his many commissioned works), Phlegm’s murals invite a questioning of not only the value of what is normally derided as a narcissistic, infantile act (graffiti that simply tags), but also the place of the private imagination in the public sphere. We may dream freely in the sanctioned spaces of our beds or baths; but what might it mean for all of us to dream as freely as this in the spaces of the cities we also inhabit? Thank-you – that’s kind of you to say. So what’s new! Your post is one of the highlights of my week! As usual, another fascinating read. yet there is something more calming – even playful and comic – within each of these otherworldy projections. Like that damn fish! suggests reinforcement; something contained, yet ready to burst into out world! – it’s genius! Perhaps it’s a submarine window? Perhaps it’s part of a fair; a massive victorian aquarium? At any rate, his reading of the surface in every work is truly transportive. So now that the ol’ mind-state is thoroughly altered, it’s time to read this over again. Thanks again for coming up with yet another fanastic write-up. Excellent – really enjoyed this. And great timing because after reading your post a recent stroll through London’s South Bank revealed one of his pieces. Not quite the illicit fun of exploring brownfield sites but a lovely surprise (and I could show off to the family). Thanks Alex – great timing indeed! I’m just about to go and see a Bansky in Detroit. I can’t top that! Look forward to the blog on it.